Rise and Shine Cleaning and Maintenance provide a range of professional cleaning services which along with residential and commercial window cleaning, they offer gutter cleaning, fascia, soffit and cladding cleaning, as well as solar panel cleaning and pressure washing of driveways, patios and decking. Rise and Shine also provide an internal cleaning service for the home and office, along with general maintenance services such as painting, gardening and carpentry. Hunters Cleaning, based in Teddington, is a family owned business with many years experience in the cleaning industry. They offer a professional, reliable and trusted window cleaning service to residential and commercial customers in the areas around South West London. With over ten years experience the company uses the high reach water fed pole cleaning equipment for window cleaning and a gutter vacuum machine for their gutter cleaning service. Operators work safely from the ground and comply with the health and safety regulation, as expected from a professional window cleaning company. Hunters Cleaning also provide cleaning services for commercial and residential communal areas, including car parks and surrounding grounds. Call 07789 287882 for further information or a cleaning quote. 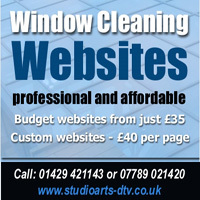 Window Gleam cleaning services are based in Hornchurch, East London. Areas they cover include Romford, Upminster, Hornchurch and the surrounding suburbs. For window cleaning the company uses water fed poles with purified water to ensure top quality results. Additional services include conservatory roof cleaning, upvc cladding, fascias, soffits and gutter cleaning. For more details please visit their website at www.windowgleam.co.uk. London Window Cleaning based in Bromley offer a professional exterior and interior window commercial cleaning service to customers in Central London and in the Greater London area. They also cover the Home Counties such as Surrey, Kent, Essex, Middlesex and St.Albans. If you’re looking for a commercial window cleaning service in London then give them a call on either of the numbers below. Pure Vision Commercial Window Cleaning are based in Palmers Green, London and provide a professional window cleaning service which includes traditional window cleaning, as well as the use of high reach water fed poles. Cherry pickers and abseiling methods are also used on certain commercial work when required on large commercial cleaning jobs. Other services they provide include gutter cleaning, cladding cleaning and solar panel cleaning. The company is fully insured and are members of the Federation of Window Cleaners. Some of their clients include Virgin Gyms and Nutfield Health. For more information contact pure Vision via their website or the numbers below. Bright Clean Windows are an independent company based in Walton on Thames and have over 20 years experience in the window cleaning trade. They specialise in work which other companies don’t always cater for. Their cleaning services include pressure washing, gutter cleaning, roof cleaning, solar panel cleaning and carpet cleaning for both commercial and residential clients. To find out more about this company and the services provided please visit their website below. J. Belgrove Window Cleaning is a family run window cleaning business located in Hornchurch. With a reliable and friendly service, they offer regular window cleaning to domestic and commercial customers. Their water fed pole system uses pure water for cleaning windows and provides many benefits to the customer as well as consistent high quality cleaning . Pure Clear Windows based in Uxbridge provide a complete and comprehensive range of additional cleaning and maintenance services as well as professional window cleaning. These include conservatory cleaning, gutter cleaning, Upvc fascia and soffit cleaning. Their window cleaning service uses the latest high reach window washing system working with water fed poles and 100% filtered pure water. JPS Window Cleaning based in Croydon provide a commercial and residetial window cleaning service in the areas of Croydon, Purley, Caterham, Sutton, Warlingham, Coulsdon, Wallington, Crawley, Mitcham, Tooting, Streatham, Wimbledon, Cheam, Redhill, Thorton Heath and Norbury. With a service that covers all types of window cleaning work including shops, schools, pubs, hotels, fitness clubs, appartment blocks, housing associations, property managment companies, as well as exclusive residential homes. Spencers Window Cleaning Services based in Wallington, Surrey uses traditional cleaning methods for commercial and domestic customers in the Surrey region including Wallington, Banstead, Sutton, Purley, Carshalton, Croydon, Caterham and surrounding areas. The Kew Window Cleaner is a professional window cleaner providing a commercial and residential window cleaning service in the following areas – Richmond, Kew, Isleworth, Twickenham, Chiswick, Sheen, Barns and St Margarets. All work is covered by a comprehensive insurance policy. Using traditional and Wfp ‘Reach & Wash’ they are happy to carry out work on residential properties as well as shops, schools and office buildings etc. Shiny Side Window Cleaners based in Cuffley, Hertfordshire is a member of the British Window Cleaning Academy and pride themselves on a quality service. The company and highly trained staff can provide a comprehensive service for anyone requiring a regular and reliable window cleaning service in the following areas… Barnet, Potters bar, Hertford, Enfield, Hatfield, Ware, St Albans and Welwyn plus other locations in the London, Hertfordshire and Essex areas. Brightview Window Cleaning Services based in North London provides a comprehensive service for internal and external window cleaning in the North London and North West of London. They also provide a commercial carpet cleaning service as well as tile and wood floor cleaning. To add to their regular existing clients they are happy to carry out work for schools, shops, hotels, offices, sport and leisure centres commercial and industrial outlets and showrooms.